I have spent the bulk of this week in a state of boredom I have not experienced in ages, probably since being a kid. Yes, I have plenty to do, and I already did that. I no longer have TV, my internet is annoyingly slow, I’ve read all my books…wah wah wah. Welcome to my pity party, it’s actually much less tragic since you’ve shown up. Thank you for that. There are my results. From the vibrant purple hue of the first link, you can see that I clicked on it. The suggestions were obvious. Call an old friend, read a book, volunteer at your favorite charity, etc. At the bottom of the page were links for similar searches. Awesome. Now I’m depressed as well as bored. I’m actually fine. And tomorrow I will expand on the root of my boredom. It’s Saturday night, why are you reading this and not painting your local town red? I’m reading this because I have the plague. It’s just a sore throat but I told my gf it was the plague so I’ll stick with that. Damn! 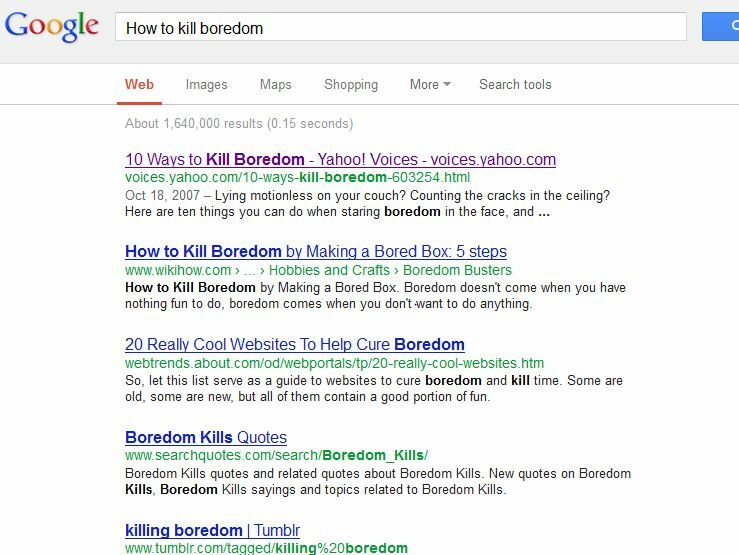 Searching for ways to not be bored turned into killing yourself a little too quickly!